﻿ Awesome Examples of Website Testimonials Done Right! Testimonials can be very powerful for helping to establish trust and encouraging visitors to buy, sign up, fill out a form, or take whatever action you are after. For websites and online businesses, testimonials can be even more useful than traditional businesses because visitors are often skeptical or hesitant to trust someone online. Some blogs have the separate section named as “Testimonials”. The “Testimonials” section should be characterized and made distinctive in a proper manner. Website testimonials can be displayed in different ways, and we’ll take a look at more than 15 examples in this post. Hopefully, these examples will give you some ideas that can be useful for your own projects. Here you’ll find some that use video, photos of customers, quotes from reviews, and more. Desk’s homepage includes a testimonial in large text with the customer’s logo. Web design has offered excellent space so that the user can easily write a testimonial. Jazz’s has an entire page dedicated to why customers have chosen them. It’s clean and simple, featuring customers reviews in a “spotlight” format. This section is showcased as a dark area and it has enough space to cover hundreds and thousands of reviews. PSD2HTML’s website includes testimonials on their “Work” page that shows customer reviews. This is a unique testimonial section with each brand logo displayed decoratively, few impressive statistics and customer’s reviews at the same page. Doteasy has an entire page dedicated to customer testimonials. Sacrificing a whole page for testimonials mean that you have something really impressive to show to the clients although it may become really confusing and time-consuming for the viewers to go through. The Pricing/Join page of ElegantThemes includes an area after the pricing options with an option to view more testimonials. The testimonial section has wide space to display the professional photography of your genuine customer. Themefuse includes a customer testimonial near the bottom of the homepage. On the left of the testimonial, there is an option to view a few more. The testimonial section has been designed nicely in accordance with the remaining section of the web page. WPZoom’s homepage includes a few testimonials from happy towards the bottom of the page. The testimonial section has covered all the things in a really nice manner and it has almost covered everything that is worth mentioning. Campaign Monitor has a page dedicated to case studies, which are just like more detailed testimonials. It has more advanced testimonial section which includes moving graphics and the testimonial section looks really professional. The StudioPress homepage rotates through testimonials, with photos, from people who are highly influential in the WordPress and blogging community. Testimonial section is displayed in a creative, detailed and more expressive way. Subernova’s homepage shows quotes from several reviews, and in some cases links to those reviews. 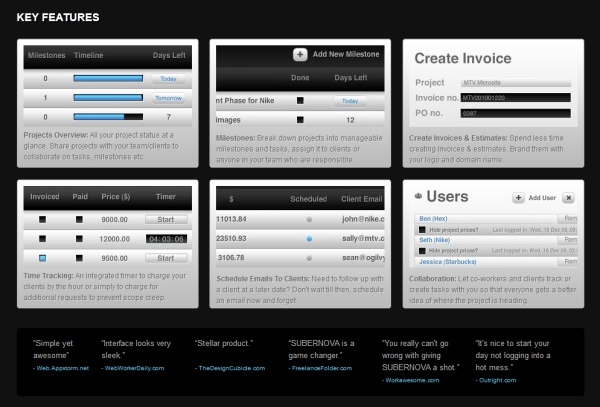 The interface has the ability to display your work or screenshots can be connected to the reviews. FreeAgent’s buzz page includes a video testimonial and several other brief text testimonials. The Business Catalyst homepage shows several testimonials, listed as “partner stories”, with photos. Each one includes a link to a more detailed case study.